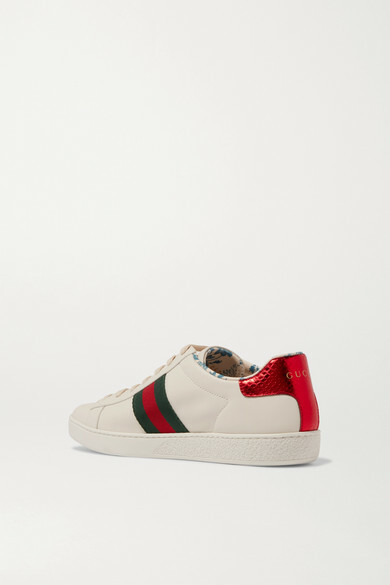 The glittered gold 'Guccy' moniker on Gucci's sneakers may look like a typo, but it's actually the medieval spelling of the brand and a tongue-in-cheek nod to fake iterations. Think the font looks familiar? Alessandro Michele has borrowed it from '80s video gaming culture and SEGA's original logo. Made from smooth leather, they're trimmed with the iconic webbed stripes at the sides and have a pretty blue rosebud-print lining. Shown here with: Acne Studios Hooded top, Alexander Wang Skirt, Gucci Shoulder bag.